Health Collection State monitoring--These monitors update the health states to each Health Collection class instance. State Propagation monitoring--These monitors update the health states to propagate from a lower associated class instance to a higher class instance. Management Software monitoring--These monitors update the health states of HP Insight Management Agents or HP Insight Management WBEM Providers. Management Software monitoring--These monitors update the health states of HP Insight Management Agents. The following table shows each set of monitors defined in the HP ProLiant Server Management Packs. Monitors the health of HP Systems Insight Manager. This Health Rollup Monitor rolls up from the ProLiant Servers Group to the HP Servers Group. This Health Rollup Monitor rolls up from the HP ProLiant ML Servers Group to the HP ProLiant Servers Group. This Health Rollup Monitor rolls up from the HP ProLiant DL Servers Group to the HP ProLiant Servers Group. This Health Rollup Monitor rolls up from the HP ProLiant BL Servers Group to the HP ProLiant Servers Group. This Health Rollup Monitor rolls up from the HP ProLiant Other Servers Group to the HP ProLiant Servers Group. This Health Rollup Monitor rolls up from the HP ProLiant Other Model Server to the HP ProLiant Servers Group. This Health Rollup Monitor rolls up from the HP ProLiant ML Server to the HP ProLiant ML Servers Group. This Health Rollup Monitor rolls up from the HP ProLiant DL Server to the HP ProLiant DL Servers Group. This Health Rollup Monitor rolls up from the HP ProLiant BL Server to the HP ProLiant BL Servers Group. This Health Rollup Monitor rolls up from the HP ProLiant Server to the Windows® Computer. This Health Rollup Monitor rolls up from HP ProLiant Processors to HP ProLiant Server. This Health Rollup Monitor rolls up from HP ProLiant Memory to HP ProLiant Server. This Health Rollup Monitor rolls up from HP ProLiant Cooling to HP ProLiant Server. This Health Rollup Monitor rolls up from HP ProLiant Realtime Monitors to HP ProLiant Server. This Health Rollup Monitor rolls up from Temperature Sensors to HP ProLiant Server. This Health Rollup Monitor rolls up from Power Supplies to HP ProLiant Server. This Health Rollup Monitor rolls up from Server Storage to HP ProLiant Server. This Health Rollup Monitor rolls up from Server Networks to HP ProLiant Server. This Health Rollup Monitor rolls up from Management Processors to HP ProLiant Server. This Health Rollup Monitor rolls up from Hardware Logs to HP ProLiant Server. This Health Rollup Monitor rolls up from UPS to HP ProLiant Server. This Health Rollup Monitor rolls up from Server Others to HP ProLiant Server. This Health Rollup Monitor rolls up from HP Insight Management Agents to HP ProLiant Server. This Health Rollup Monitor rolls up from HP Insight Management WBEM Providers to HP ProLiant Server. This Health Rollup Monitor rolls up from HP Systems Insight Manage to HP ProLiant Server. 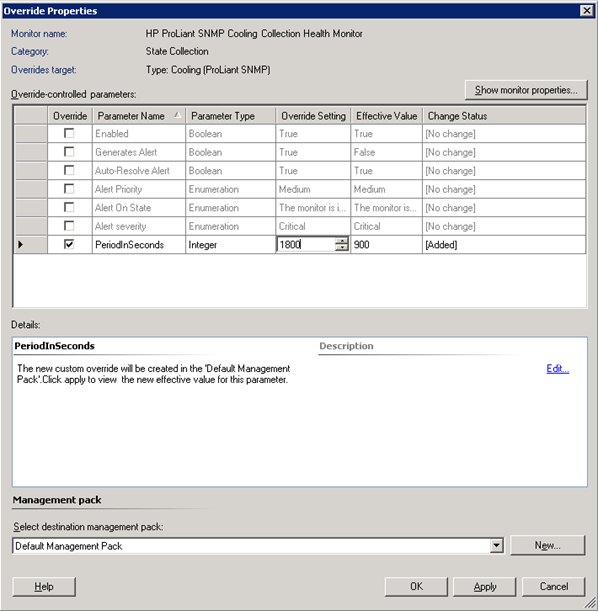 A Unit Monitor runs a script to get HP ProLiant SNMP Processors Collection Health. Runs a script to get HP ProLiant SNMP Memory Collection Health. Runs a script to get HP ProLiant SNMP Cooling Collection Health. Runs a script to get HP ProLiant SNMP Realtime Monitors Collection Health. Runs a script to get HP ProLiant SNMP Temperature Sensors Collection Health. Runs a script to get HP ProLiant SNMP Power Supplies Collection Health. Runs a script to get HP ProLiant SNMP Server Storage Collection Health. Runs a script to get HP ProLiant SNMP Server Networks Collection Health. Runs a script to get HP ProLiant SNMP Management Processors Collection Health. Runs a script to get HP ProLiant SNMP Hardware Logs Collection Health. Runs a script to get HP ProLiant SNMP Server Others Collection Health. Monitors the health of HP System Management Homepage. Monitors the health of HP Insight Foundation Agents. Monitors the health of HP Insight Server Agents. Monitors the health of HP Insight Storage Agents. Monitors the health of HP Insight NIC Agents. Monitors the health of HP Version Control Agents. Monitors the health of HP ProLiant Remote Monitor Service. Monitors the health of HP ProLiant Rack Infrastructure Interface Service. Monitors the health of HP ProLiant System Shutdown Service</Description>. Monitors the health of HP Insight Event Notifier. Monitors the health of HP iLO Passthrough Service. Monitors the health of HP ProLiant Health Monitor Service. Monitors the health of HP ProLiant Remote IML Service. Runs a script to get HP ProLiant WMI Processors Collection Health. Runs a script to get HP ProLiant WMI Memory Collection Health. Runs a script to get HP ProLiant WMI Cooling Collection Health. Runs a script to get HP ProLiant WMI Temperature Sensors Collection Health. Runs a script to get HP ProLiant WMI Power Supplies Collection Health. Runs a script to get HP ProLiant WMI Server Storage Collection Health. Runs a script to get HP ProLiant WMI Server Networks Collection Health. Runs a script to get HP ProLiant WMI Management Processors Collection Health. Runs a script to get HP ProLiant WMI Hardware Logs Collection Health. Runs a scrip to get HP ProLiant WMI Server Others Collection Health. Monitors the health of WMI Providers Service. Monitors the health of HP WMI Storage Providers. Use the following procedures to override individual monitor properties. Select the Authoring tab, and select Monitors. Enter the monitor rule name in the Look for textbox. Select the monitor rule from the Search results screen. The information displays in the Monitor Details pane. Click View Knowledge to access the definition of the monitor. The Properties dialog appears. To override the settings of this monitor, click the Overrides>Override the Monitor. Select the Override checkbox next to the appropriate Parameter Name from the menu. The Override Properties dialog window appears. All available overriding parameters display in the dialog window. Select the entry to override, and enter the Override Setting.